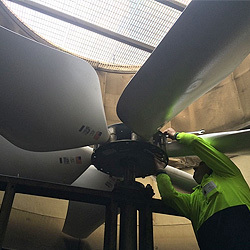 Blog: A series of complex mechanical parts, plastic fans, PVC fill pack and drift eliminators form the backbone of a high-performing cooling tower. They’re technologically refined and intelligently engineered, built to maximise energy savings while providing a safe legionella free and a productive cooling solution. On traveling back in time, early cooling towers and evaporative condensers were the tall metal stacks that relied on pacific heat transfer from a prevailing wind. They passed potable water directly through condensers which caused evaporative cooling, leaking vital fluids into drains. This wasteful practice has long since faded away, leaving cooling tower performance engineers to focus on water saving recycling systems, fluid filtration, drift reduction, and the mechanics involved in atmospheric lakeside cool type heat rejection. In evaluating cooling tower performance, we’re constantly reevaluating the air conditioning and refrigeration systems that generate chilled air. Scale is a problem, as is the areas on the tower where biological growths prosper so water treatment is required. A state-of-the-art maintenance program takes care of this issue, plus there are water conditioners working in concert with the mechanical maintenance strategy. Meanwhile, newly installed variable speed fans VSD’s are reacting instantly when the cooling cycle slows, thus actively helping to modulate the cooling process. Similarly, variable flow spray pumps are adapting to ensure the fill medium is properly wetted at all times. Accumulated solids are eliminated via bleed in this manner, leading to a rise in fill pack efficiency and a simultaneous drop in excess evaporation, the watery mists that overfill drain channels. High-quality drift eliminators support this latter function, and air intake louvers stop water splash out. Clean water distribution nozzles allow full water flow, and rubber grommets allow easy removal for maintenance. Hot water decks require sunlight protection to reduce bacteria, often identified in risk management plans, RMP. Confined space entry needs to be always considered when inspecting cooling tower components such as suction strainers, ball float valves, overflow, and drain lines. A JSA should be completed before a basin in entered. Gas testing needs to take place to ensure oxygen levels are safe in pits tanks and there are no ammonia leaks from the condenser coils. The aim is to keep all BAC cooling tower performance on the cutting-edge, ahead of the technological curve by introducing better materials and superior engineering solutions. The solutions address environmental concerns, sewage trade waste issues, and energy saving methodologies. They recycle conditioned treated water, introduce noise abatement baffles, sound attenuators, maximise heat exchange processes, and keep costs low. There’s more to look forward to in the next few years, with an improved relationship between airflow delivery and cooling water management opening the way to greater system improvements.